It was 2006, and I was 13 years old. My family and I were in Bay Harbor (Northern Michigan) in late June for what was then known as the Bay Harbor Concours d'Elegance. As a young car nut, it had become tradition to attend the event. Over the years, however, I had come to the realization that with few exceptions, I liked the idea of the Concours more than the event itself. Don't get me wrong. I enjoyed attending a pretty spectacular, little-known car show in my all-time favorite city in Michigan. There was, however, one problem. As the name suggests, the Concours was a show tailored to award-winning classics and American muscle. What's wrong with that? Well, thirteen-year-old me didn't particularly enjoy vintage cars. Call it immaturity. Call it being uncultured. I wasn't interested in them. As my family returned home following dinner on the eve of the official start to the Concours, I convinced them to drive down to the Village (Bay Harbor downtown) so I could check out this year's prospects in the form of dealer-brought cars. As we descended into the Village, I did the same thing that I did every June around this time. I crossed my fingers and desperately hoped that I would find myself in the presence of almighty supercars. We rounded the corner, and I can honestly say that thirteen-year-old, prepubescent me screamed like a little girl when I saw it – a Bugatti Veyron. To put things into perspective, in my progression of automotive obsession, I had just moved on from the tuner world (straight out of the Fast and Furious series) and into the realm of supercars. The single car that I credited to this switch was Bugatti's latest and greatest. You could have argued with me that the Veyron was a soulless, mechanical robot but in my young, impressionable mind, that would not take away from the fact that it was a road car with an unfathomable 1,001 hp. I was that obnoxious kid who knew stuff about it that nobody else seemed to know or care about – that something like a single oil change could cost in the neighborhood of $21,000; that, at top speed, the Veyron's massive 26.4 gallon tank would empty in 12 minutes; and that the roof's air intake grates had to be made of titanium after a bird got an intimate look at the internals of Bugatti's awe-inspiring W16 during high speed testing. Combine this obsession with the notion that adolescent me thought I would go my whole life without seeing a single Veyron on the road, and you can begin to understand my elation. To further explain my ecstasy, it is important to consider the month and year. As I said, the Concours was in June of 2006. 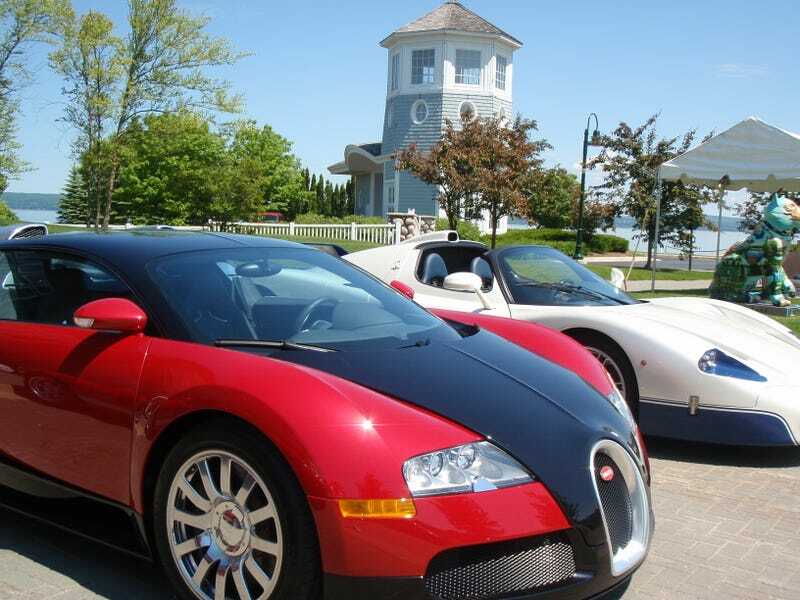 It is my understanding that the first production Veyron landed on US soil in April of 2006. Less than three months after the very first production Veyron drove on our poorly mended US roads, one graced me with its presence. At a time when there were a reported 8 in the entire nation, I saw one in a town of fewer than 2,000 residents with no barring, red gates and no handler barking at you to keep your distance. It sat before me in all its glory, and there wasn't a soul in sight. After circling the car for what felt like miles, I got back into the family minivan and returned home. The following day, I woke up bright and early for the first official day of the show. Not surprisingly, I headed straight for the Veyron. This time, there was a man sporting a Bugatti polo to answer questions - the handler I had avoided the day before. At this age, I was generally shy though apparently not that day. Taken aback by the facts and stories I was spitting back at him, the spokesman decided to take me on a personal, 360° tour of the Veyron. The best part about it? He spoke to me not as a lowly kid but rather as an enthusiast. I came to find out that this was the Veyron that Bugatti used in their official press release photos - the same car that had been thrashed around Utah's Salt Flats. It had the flaws to prove it. The spokesman called my attention to the side splitters, noting their uncharacteristic sparkle in the rising sun. It turns out that the sparkle was actually salt granuals that had embedded themselves in the sills during torturous, high speed testing. Simply awesome. Later that day, a second Veyron was brought to the show. I now had twenty-five percent of the nation's Veyrons before me. Overwhelmed, I neglected the Lamborghinis (both Murcielago and Gallardo), the Panoz Esperante, the Ford GT, the F40, and yes, even one of the most obscure cars on the planet, the Vector W8. Ferrari F40? Please. These ten supercars make that piece of junk seem as common as a Toyota Corolla. The 2007 Concours was a bust in my mind with no exotics. However, in 2008, a private dealer brought a Veyron, a Maserati MC12, an F430, an Aston Martin DB9, a DBS, and a Spyker C8 Spyder. According to legend, the owner of that dealer was clocked at 150 mph in a 55 mph zone in the Veyron the weekend of the show and was politely asked not to return the following year. With that, the Concours returned to the boring show it once was. Few (if any) exotics made appearances in subsequent years. Sure, the West Coast's Cars and Coffees may regularly feature more of the rarest cars on the planet. Yet I don't think those C&Cs could ever mean as much to me as the 2006 Bay Harbor Concours d'Elegance. It was a show that allowed my childhood naivety and unhindered enthusiasm to thrive. It allowed me the opportunity to experience the earliest examples of a car that means more to me than can be put into words. To top it off, it took place in Michigan's best-kept secret, my favorite city in Michigan. I sincerely hope that I'm proved wrong. Until then, I will happily maintain the 2006 Bay Harbor Concours d'Elegance as the best car show that I have ever attended. This begs the question: What is the best car show you've ever attended?